Title page of newly acquired pamphlet. The Kentucky Library Research Collections in the Department of Library Special Collections recently acquired a rare pamphlet about the status of the Kentucky Lunatic Asylum (Lexington) published in 1841 by Prentice and Weissinger of Louisville. 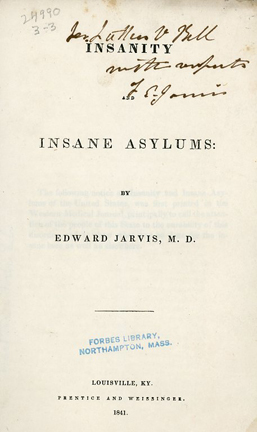 The pamphlet, Insanity and Insane Asylums, by Edward Jarvis discusses asylums throughout the United States with particular emphasis on the four mental health institutions at: Lexington, Kentucky, Charleston and Worcester, Massachusetts, and Columbus, Ohio. Jarvis mentions the physical plants of each facility as well as their methodologies. He is particularly interested in statistical information collected from the various institutions, including total number of cases, patients that were discharged, duration of stay, percentage of cures, percentage of deaths, etc. 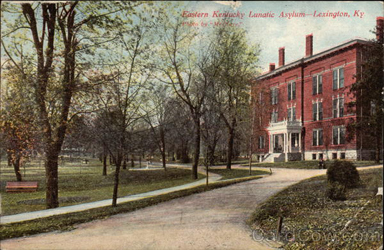 Jarvis, a young physician who moved from Massachusetts to Kentucky, used statistical information from the pamphlet to lobby the Kentucky General Assembly to convert the Lexington asylum from a purely custodial institution to a modern mental hospital using the “moral treatment.” This treatment attempted to inculcate self-control in patients rather than impose violent coercion. Proponents of the moral treatment envisioned the asylum as a curative milieu that would instill discipline through the gentle influence of a carefully regulated, meticulously sane environment. They expected the insane to benefit from the order of a daily routine, the satisfaction of meaningful employment, the intellectual stimulation of diversions, an identity in the asylum community, and above all the guidance of the asylum personnel. In the course of his work, Jarvis befriended perhaps the most important citizen advocate for the humane treatment of the insane, Dorothea Dix. During the 1840s, Dix, also a native of Massachusetts, no doubt, corresponded frequently with Jarvis. During that decade, she visited the Commonwealth more than once petitioning the General Assembly to open an additional mental health facility west of the Green River. The legislative heeded her entreaties as well as those from mental health professionals and approved funds to construct Western State Hospital in Hopkinsville in 1848. Jarvis returned to Massachusetts in 1843. His interest in vital statistics resulted in his gaining a notable reputation as a statistician. His library on the topic was eventually donated to the American Statistical Association. WKU is one of twelve libraries in the country that own this title, and the only repository in Kentucky. It’s uniqueness includes the fact that the author signed this copy and inscribed it to Luther V. Bell, the superintendent of the McLean Hospital for the Insane which was located in Charlestown, Massachusetts.